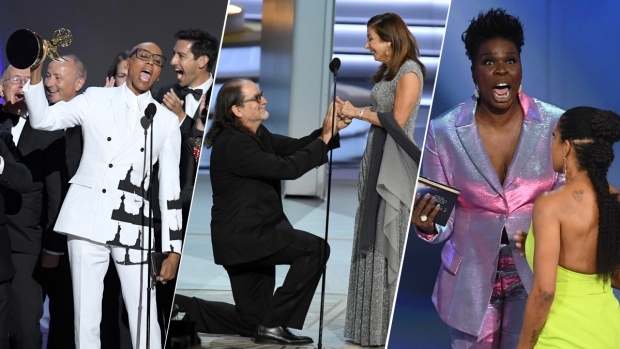 List of winners at the annual Primetime Emmy Awards, announced Monday by the Academy of Television Arts & Sciences. Drama Series: "Game of Thrones"
Actress, Drama Series: Claire Foy, "The Crown"
Supporting Actor, Drama Series: Peter Dinklage, "Game of Thrones"
Writing, Drama Series: Joel Fields and Joe Weisberg, "The Americans"
Directing, Drama Series: Stephen Daldry, "The Crown"
Supporting Actor, Comedy Series: Henry Winkler, "Barry." Writing, Comedy Series: Amy Sherman-Palladino, "The Marvelous Mrs. Maisel"
Directing Comedy Series: Amy Sherman-Palladino, "The Marvelous Mrs. Maisel"
Actor, Limited Series or Movie: Darren Criss, "The Assassination of Gianni Versace: American Crime Story"
Actress, Limited Series or Movie: Regina King, "Seven Seconds"
Supporting Actor, Limited Series or Movie: Jeff Daniels, "Godless"
Supporting Actress, Limited Series or Movie: Merritt Wever, "Godless"
Writing, Limited Series: William Bridges and Charlie Brooker, "USS Callister (Black Mirror)"
Directing, Limited Series: Ryan Murphy, "The Assassination of Gianni Versace: American Crime Story"
Writing, Variety Special: John Mulaney, "John Mulaney: Kid Gorgeous at Radio City"
Directing, Variety Special: Glenn Weiss, "The Oscars"
Variety Sketch Series: "Saturday Night Live"
Variety Talk Series: "Last Week Tonight With John Oliver"
Reality-Competition Program: "RuPaul's Drag Race"